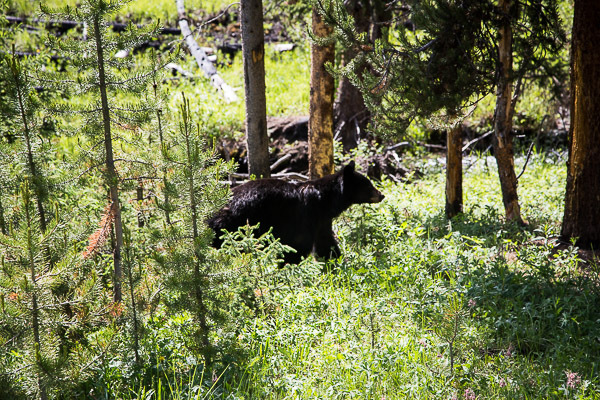 This is the third post (of four) in which I’m sharing our itinerary for our recent trip out to Jackson Hole, Grand Teton National Park, and Yellowstone National Park. The first post is here, and the second post is here – in case you missed them. 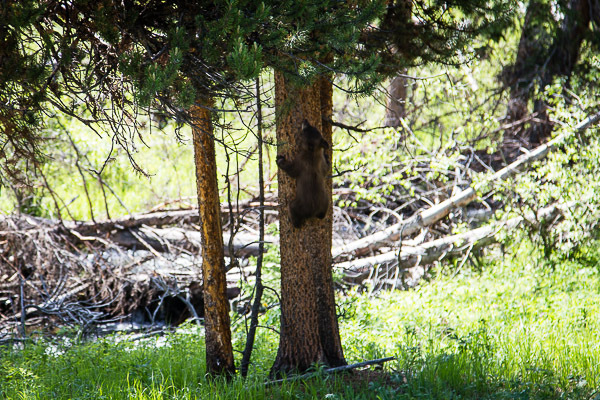 One unexpected upside to Yellowstone was the disconnection to the outside world. There were no televisions in the hotels, and WIFI (for a fee) was only available at a handful of locations in the entire 2.2 million acres. There was also no radio. We usually listen to radio in the car, but we lost the signal shortly after entering the park from the south entrance. The silence, initially palpable and deafening, was soon comfortable and expected. 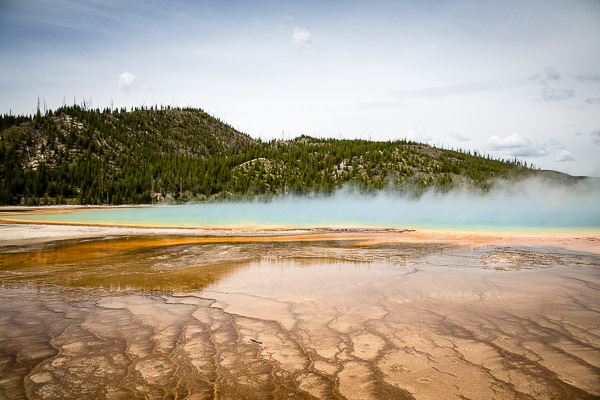 Grand Prismatic Spring, in the Midway Geyser Basin in the Old Faithful area. We left the Old Faithful Inn that morning of day 5, and both kids immediately powered on the iPads and began building their own versions of the 100+- year-old hotel, complete with geysers in the pixelated font lawn of the game. 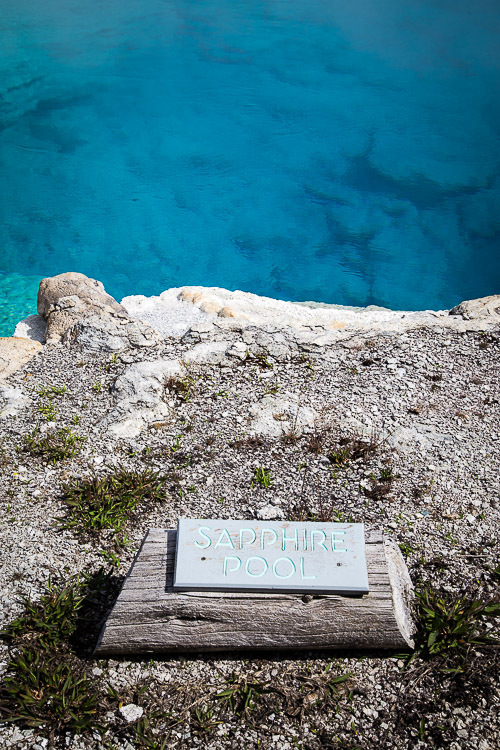 We stopped to see more geysers and geothermal features after leaving the hotel. 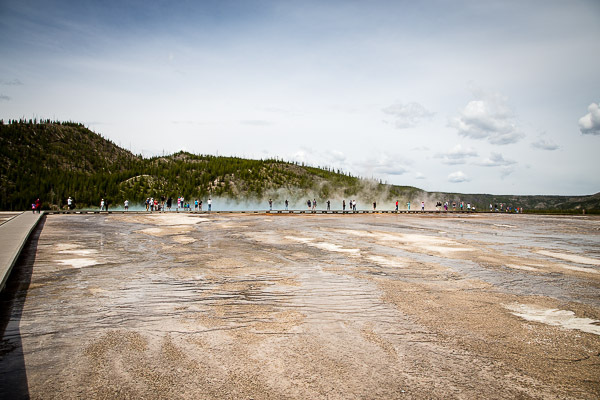 Old Faithful is only one of many geysers in Yellowstone, and the park is filled with hot springs in all shapes and sizes. 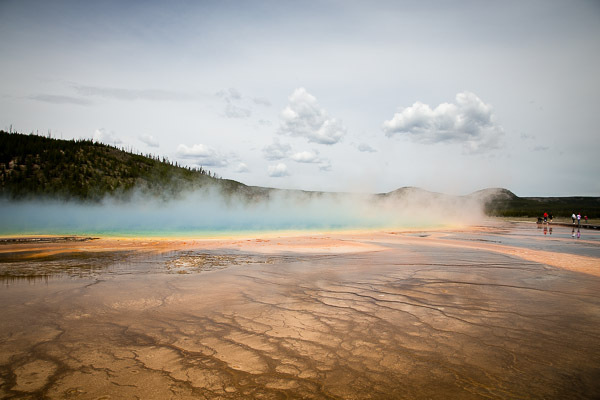 The Grand Prismatic Spring is the largest hot spring in Yellowstone, and arguably the most beautiful. The intensity of the colors – a rainbow of colors – was almost inconceivable. The intensity of the odor was incredible, as well, but in a less positive way. 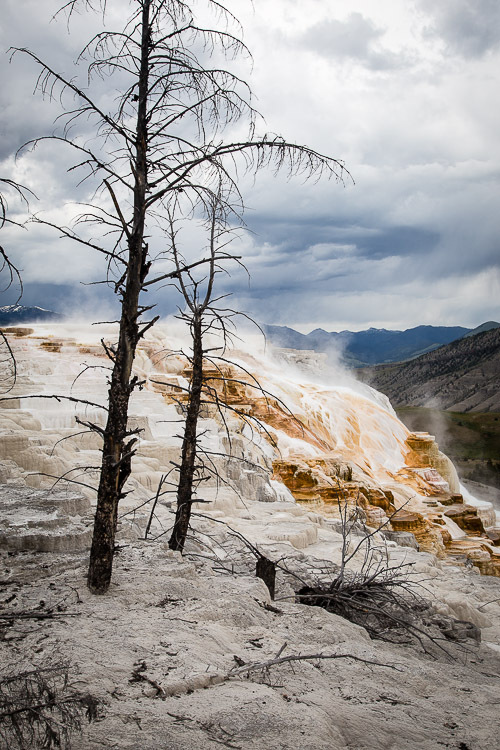 Mammoth Hot Springs was the next stop on our agenda that day. We’d hoped to make it to Mammoth by noon, but construction on the road between Norris and Mammoth delayed us by a couple of hours. We had a late lunch at the Mammoth Hotel Dining Room, about 30 minutes before it closed until dinner. Despite our late arrival, the staff were welcoming and friendly, especially the one who knocked the full water glass over on me. A female elk in the Mammoth area. 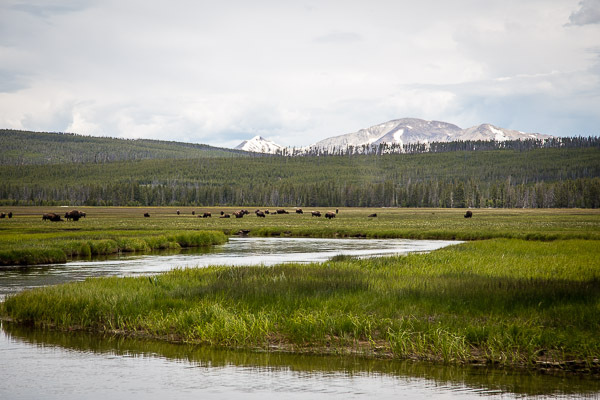 The animals of Yellowstone are the true owners of that park, and Mammoth was a good example of that. 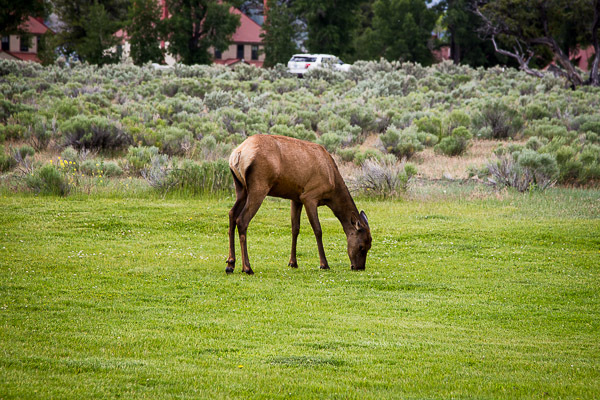 Elk roam freely in the center of the town area, and park rangers are quick to chastise eager tourists wielding cameras and iPhones who attempt to get too close. 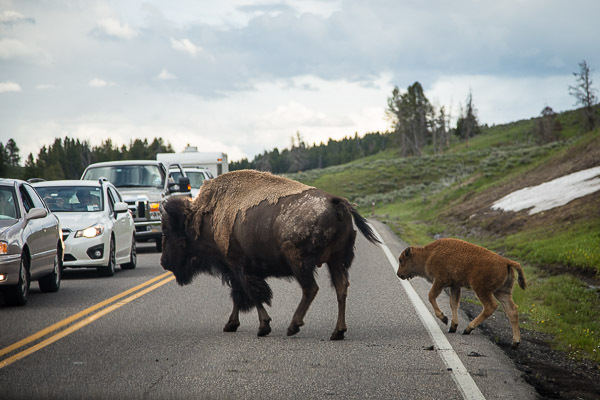 We were told that more human injuries are caused by encounters with elk and bison than by bear attacks, so we were very good rule followers when it came to wildlife. 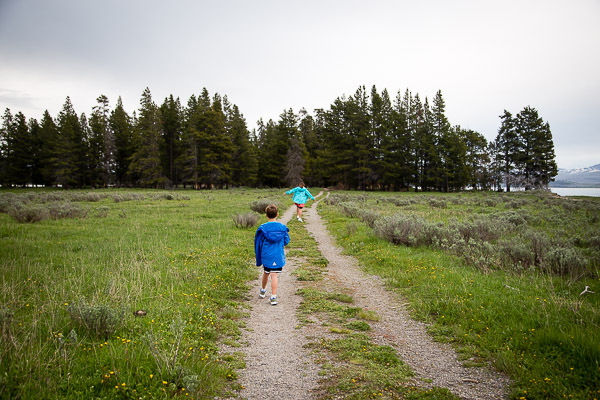 After leaving Mammoth Hot Springs, we headed toward our next hotel for the night – the Lake Lodge Cabins, on the edge of Yellowstone Lake, in the southeastern side of the park. One of our stops along the way was the Tower Falls area. 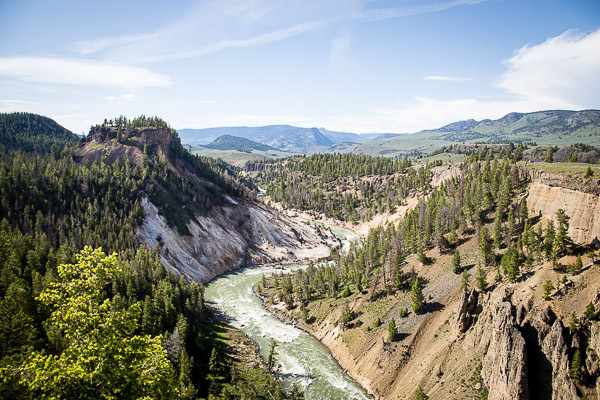 From a viewpoint along the side of the road, we stood looking across the canyon and down the length of the Yellowstone River. Oliver pointed out a bald eagle flying below our vantage point. A tree nearby leaned out over the canyon, and in it’s branches perched a gorgeous Western Tanager, its crimson head standing out in stark contrast to its yellow body and black wings. Across the canyon, several pronghorn antelope grazed in the distance. I took each of these as signs, and this area now has a new and special meaning for me. We pointed out bison anyway. Just to annoy them. A typical source of traffic jams in the park. The nights of day 5 and of day 6 were spent in the Lake Lodge Cabins, and I could have happily stayed there longer. 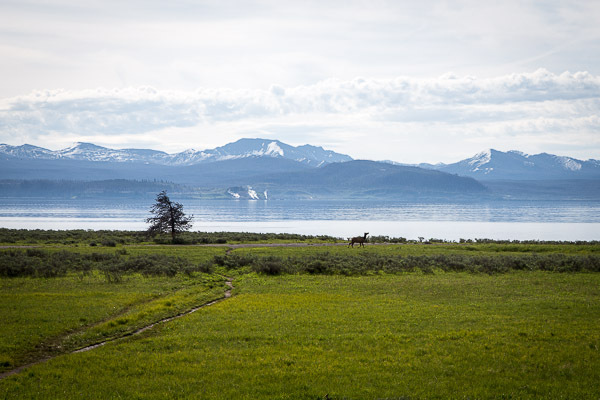 The views of the lake from the front of the hotel were gorgeous, and we were able to watch elk and bison from the front porch of the main lodge. Wolfie, Lucy the Bison, Penguin, Eeyore, and Foxy. 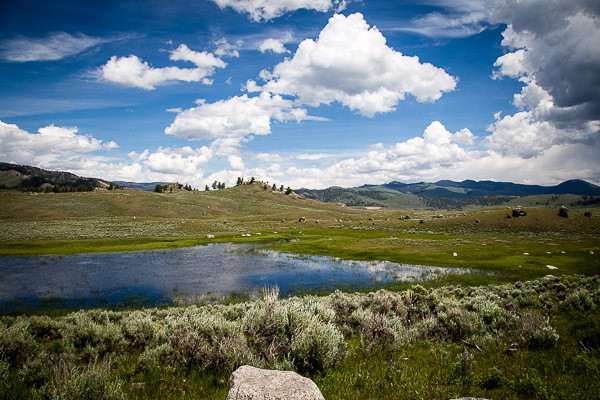 On our sixth day, our only plans were to drive north to the Lamar Valley. We had a dinner reservation at the Lake Hotel Dining Room at 5:30, but other than that, nothing else was scheduled. 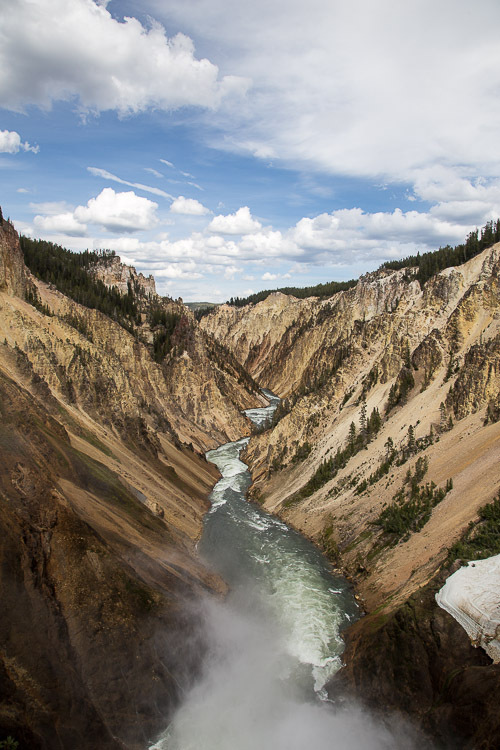 Our first stop was to the Grand Canyon of Yellowstone. We took two hikes while we were there, both to see waterfalls – one hike to view the Upper Falls, and the second to view the Lower Falls. During the first hike, the kids made fun of us for our looks of exhaustion as we trekked up the steep path back to where we started. They joked that they were much better hikers than we were. The hike down the canyon to view the Lower Falls was much more steep (a descent of 600 feet) and much longer (about 3/4 mile one way), with an incredible view of the Lower Falls as the reward. The loose gravel and slippery rocks along the path made the climb down as treacherous as the climb up was exhausting. Oliver fell on the way down and refused to speak to any of us (other than yelling) for the rest of the hike. 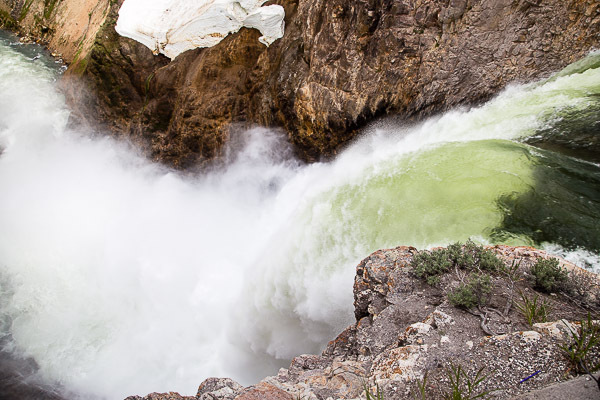 The Lower Falls in the Grand Canyon of Yellowstone. 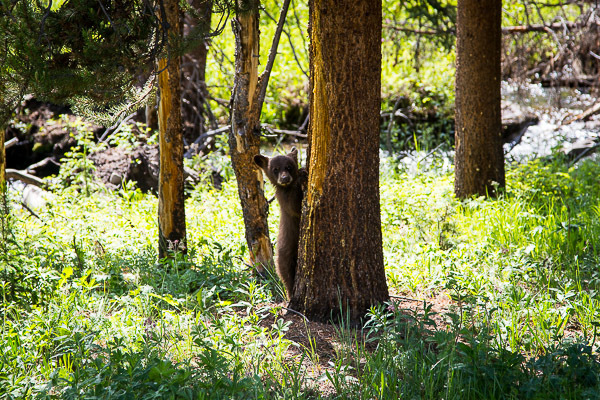 We saw bears almost every day during our stay in the national parks, and one of the most special was our sighting of a mother black bear and her cub in the woods just north of Canyon Village. As it always did, traffic slowed to a stop as we all tried to get just the perfect shot of the animals. This was also one of the moments when I realized I needed a much stronger zoom lens. The time slips by quicker in Yellowstone. So often, we realized that we were rushing because the day was getting short. 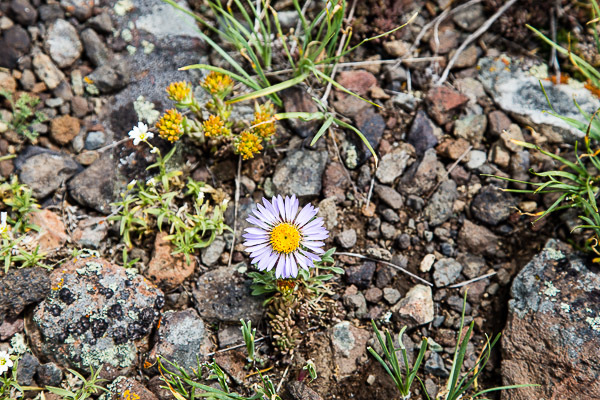 We stopped frequently during our drives, all of us needing some time out of the car to wander, to pick up rocks, to look through binoculars, to kick dirty piles of snow, and to admire the ground under our feet. 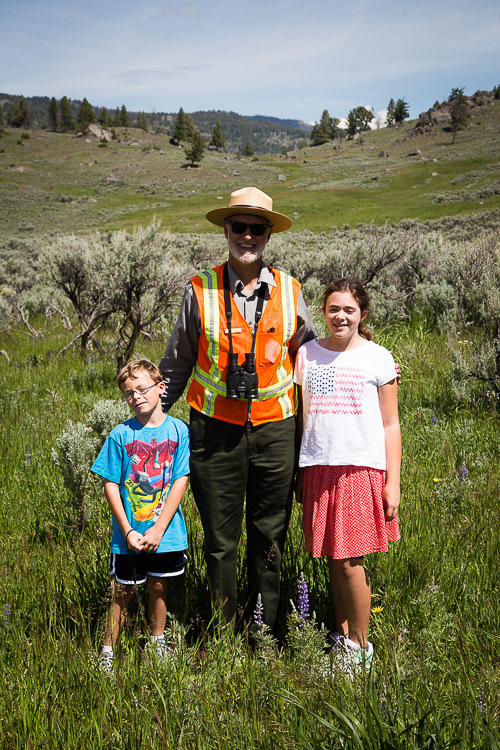 We packed a picnic lunch on the sixth day – plastic-wrapped sandwiches and chips from one of Yellowstone’s General Stores. 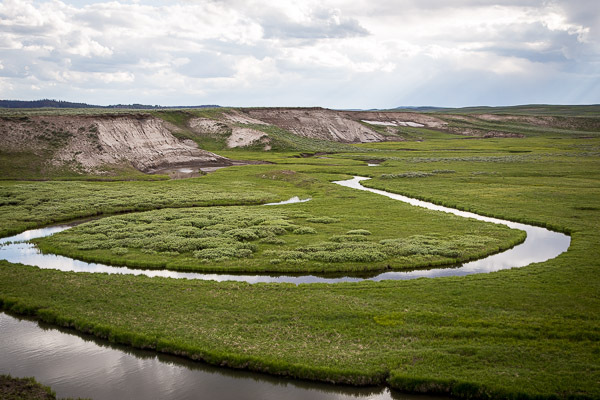 We didn’t want to waste any extra time that day in a restaurant, instead choosing to have lunch by a stream in the Lamar Valley. The ham sandwiches were bland and nondescript, but eating them in that spot, in the fresh air, surrounded by all of that beauty, made them one of the tastiest lunches of the trip. 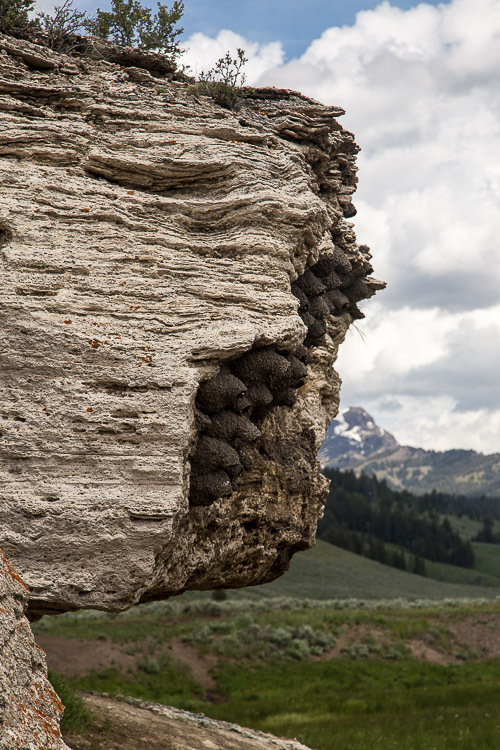 Cliff swallow nests at the Soda Butte rock formation (an extinct geyser) in Lamar Valley. 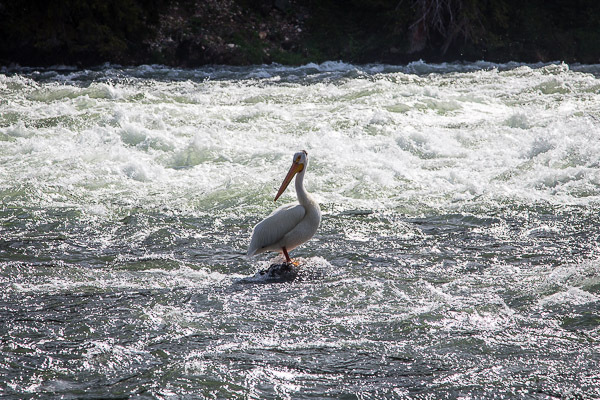 An American White Pelican, spotted at LeHardy’s Rapids, north of Yellowstone Lake. We were thirty minutes late to our dinner reservation that night. 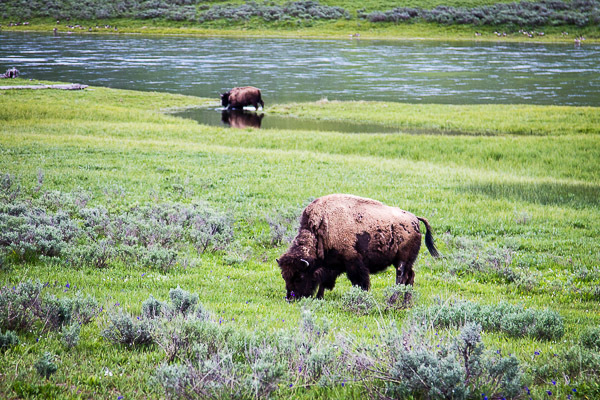 I explained our reasons – a bison traffic jam, mostly – to the somber hostess at the Lake Hotel Dining Room. She was not sympathetic or the slightest bit amused, but she seated us anyway. Clearly she’d heard that excuse before, and she was not impressed. We chose the buffet that night, and it was an excellent decision. I highly recommend the bison pot roast, the potato gratin, and the chilled rhubarb-strawberry soup. I’m still thinking of that soup, and when my new toy is delivered in the next couple of weeks, I’m going to try to recreate it. Our evening ended with a short hike down to the lake and back, and two more animal sightings – an elk by the lake and two bison in the parking lot. We’d been making a list of all the animals we spotted, and those two days yielded some good additions: a bald eagle, deer, elk, bison, black bears, cinnamon-colored black bears, mountain goats, pronghorn antelope, a grizzly bear, cutthroat trout, a mountain chickadee, sandhill cranes, marmots, a western tanager, numerous swallows, and an American white pelican. On day 7, we would leave Yellowstone and head back to Jackson Hole for a couple of nights before taking a flight back home. I went to bed that night feeling a bit melancholy. The trip was nearing its end, and I hated for it to be over. The view in front of Yellowstone’s Lake Lodge Cabins. In front of the Lake Lodge Cabins, on Lake Yellowstone. Mammoth Hotel Dining Room – We were able to walk in and be seated for a late lunch, but if you want to dine during peak hours, make a reservation to be safe. Lake Lodge Cafeteria – This is truly a cafeteria. We ate here for breakfast and for dinner. Breakfast was great. Dinner was not, but they had been overwhelmed with several large bus groups. On the positive side, there is a full-service bar right outside the cafeteria. So glad the stars aligned and you finally made it. My fav photo is the one of your converse. Something really sweet about that. I’m so glad you finally were able to make the trip – your pictures really make me want to go back to NYC. so glad you were able to make this trip MJ. That hotel looks gorgeous. Good for you. You both really deserved this trip. My city looks so much better through your lense than my everyday weary commuter eyes! So glad you got to enjoy it. It’s special this time of the year and especially what you needed! Happy birthday, MJ. So glad this trip worked out. 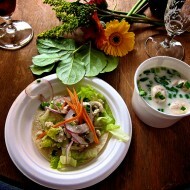 Enjoyed your photos. They make me miss NYC. I’m happy that this long-planned trip finally came to pass for you and your husband. Your son was lucky not to have injured himself worse and I’m glad he was well enough to leave with his Grammy so you could travel. 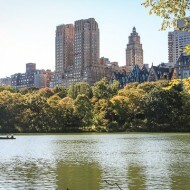 Your time in New York was very well spent, great photographs. I’ve never seen a hotel room decorated with so many pictures!